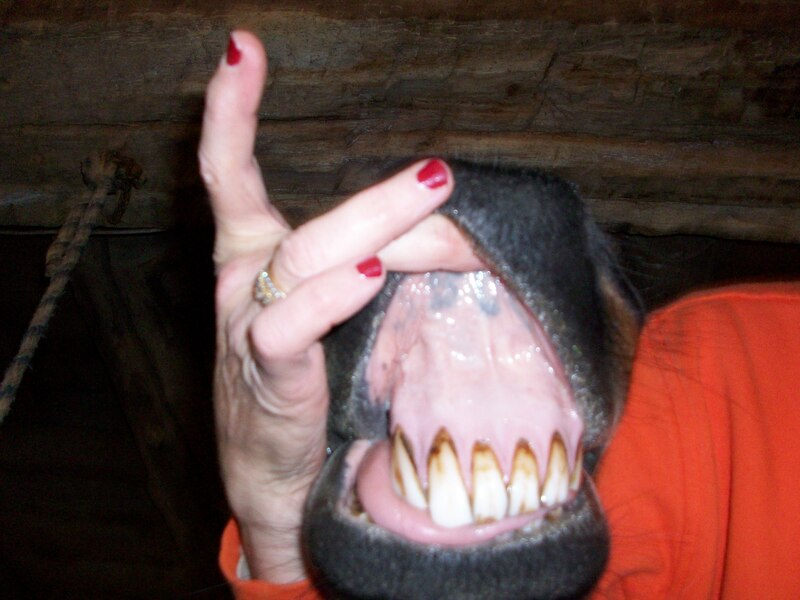 Yep, my 845 pound Standardbred had his first visit to the dentist in a very long time the other day. Actually, the ‘dentist’ came to him and the ‘dentist’ was our vet who from a most practical point of view, always makes house, um, that is, barn calls. To be blunt, Buzzy needed to see the dentist, as in badly. For the last few months, he was dropping grain and leaving great gobs of grass behind when he grazed. Fortunately, he hadn’t lost weight, but mainly because we’d upped the ante on his daily grain and hay rations. Horses need dentistry because over time their teeth develop very sharp points that make it difficult for them to chew properly as well as potentially cause ulcers in their mouths. With Buzzy there is the additional complication that many years ago, he’d been kicked in the jaw and had it broken by an unwilling mare. He’d had to have emergency surgery to wire it back together. He came out of this ordeal with several missing teeth and one very pronounced snaggletooth, which he takes great pleasure in displaying. So our vet Anne came and Buzz was first in line. Protocol is to sedate the horse and then Anne has this marvelous device on which she places the horse’s head while she does her job. She gave Buzzy the standard amount of sedative for a horse his size only it hit him as if it had been the standard amount for a much bigger horse. We got his nose up from touching the ground, and two of us together lifted his head onto the shelf but then it became very interesting. Let it be said – his teeth got done and he is a new horse in many ways. But, in this process, it took two, sometimes three of us to keep him on his feet. Have you ever seen a horse swaying in the breeze? Or one who has fallen (hard) off the wagon? That was my Buzzy! Like I said, now he’s a different horse. Today it didn’t take him 15 minutes to eat ½ quart of grain and he didn’t leave tufts of grass everywhere when he grazed. He even seemed happier with the bit in his mouth and that snaggletooth positively sparkled in the sunlight.